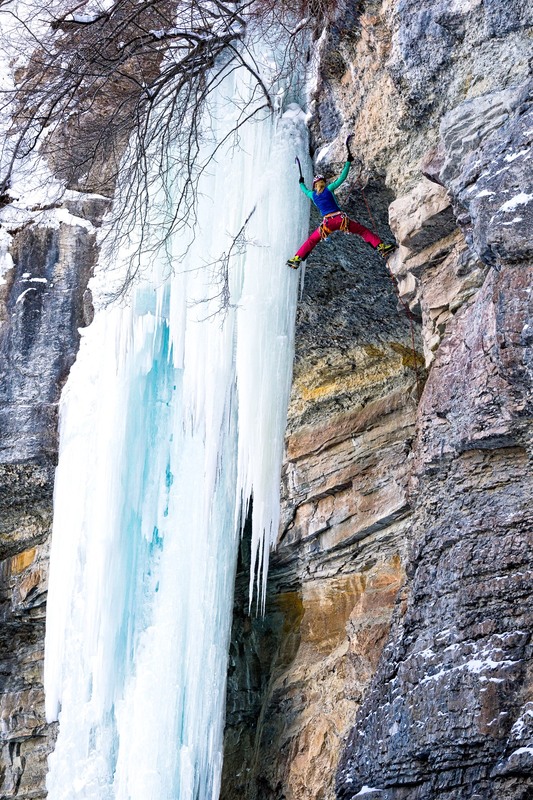 As soon as Beth Goralski first tried ice climbing, she was hooked. She became obsessed with the aggression and exhilarating intensity that defines the sport. However, after 8 years of committing herself to the sport, her body started to feel the pressure. After suffering a season ending injury, she learnt some life changing lessons about herself and her climbing ability. 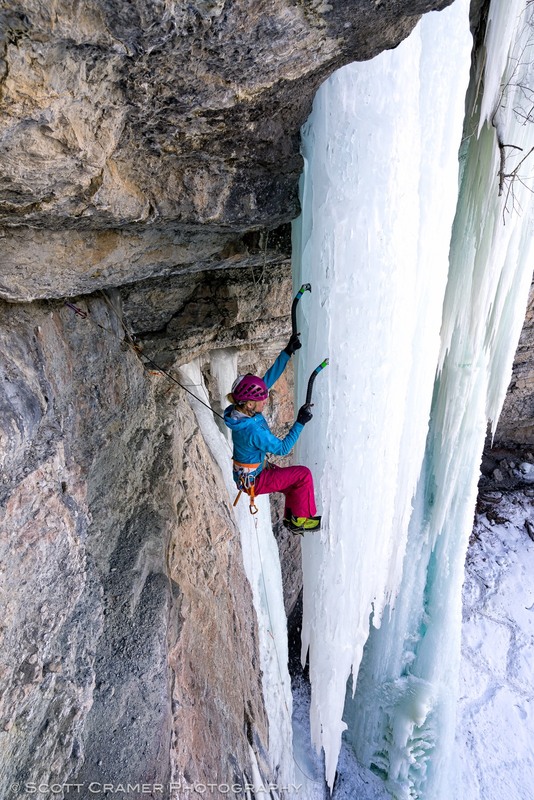 We spoke to Beth about her story 'Cracking the Ice' and how she has balanced her drive for exhilaration with the changing realities of her ice climbing career. Rock climbing is a more common sport to pursue that ice climbing. Why did you decide to start ice climbing instead? I started with rock climbing when I was at university and didn’t get involved in ice climbing until later on. I love rock climbing and the athleticism and mental strength that comes with it. It was ice climbing though where I found a particular talent, so I have focused my energy there. The precise aggression and the exhilaration is the perfect combination for me. I still enjoy rock climbing though and it’s great to be able to climb all year round. You mentioned that there is precise aggression and exhilaration that comes with ice climbing. How does this compare with rock climbing? What are the big differences in the way you climb? In comparison to ice climbing, rock climbing is like a gentle caress of the rock face because you are simply pulling yourself up from tiny handholds. In ice climbing on the other hand, you’re swinging a large axe. Even though the ice tool itself can hold onto to tiny holds, the sensation of holding onto a large handle made for gripping is notably different. Can you tell us more about the process of completing a climb? How do you prepare for each climb? Like with any sports competition it is important to be mentally prepared. So, I try to channel my nervous energy in a positive way. Which mostly involves, visualising myself on the climb and reminding myself to take deep breaths. Ice climbing seems can be seen as quite dangerous, since you are working with something so fragile. Have you ever had any worrying experiences, where you thought you were in serious danger whilst climbing? There have been a couple of climbs where there was a serious threat of broken legs, paralysis and even death. If something did go wrong, a rescue attempt would likely be either impossible or heavily delayed. My instincts for self-preservation do kick in when I feel something is going to go wrong. It is when I am in serious danger that I sometimes wish I was at home watching TV rather than risking my life. At the end of the day though, I need the satisfaction and excitement which ice climbing gives me. You’ve mentioned the exhilaration you feel when you are ice climbing. Is this what motivates you to keep climbing? What are your other big motivations for pursuing ice climbing? The feeling of exhilaration is certainly a big motivator. Nothing else excites me quite like ice climbing. Even when I was younger, I was constantly seeking sports that satisfied my thirst for high endorphin levels. Pursuing something through which I can push myself has also always been important for me. I constantly surprise myself with what I’m able to accomplish when I let go of fear and trust my body. Where do you think this drive for exhilaration and endorphin levels comes from? My parents encouraged me to try all sorts of different sports. I have done ballet, swimming, tennis, gymnastics and more. Music and the arts didn’t appeal to me. I was always desperate to be moving around. I also grew up in a time when it was ok for parents to kick you out of the house and say; “we’ll see you when it gets dark”. As a result, I have great memories of going on adventures with my friends and climbing enormous willow trees in the neighbourhood. You recently sustained a serious hip injury. What impact has this had on your mentality? Yes, that’s right, although the injury actually came through running as I wasn’t climbing at the time because of a shoulder injury. I injured my left hip labrum and had to have surgery. Even when I was injured, I wanted to push myself. The injury meant an end to my ice climbing season. It did however give me a chance to slow down and gain a new outlook on ice climbing. I used to think resting wasn’t for me and refused to accept how important it is for the body. Now, having severely cut back on my activities, I realise the importance of rest on the mind and the body. The climbing I am doing while I’m recovering consists of easier climbs which I would never normally do. It has taken me back to when ice climbing was about having fun and being with my friends rather than about constantly pushing myself and seeking exhilarating climbs. The injury has given me a new lease of life and I am more motivated than ever to climb. From what you’ve said, getting injured when you did gave you the chance to fall back in love with your sport. Do you think that is common for high achieving athletes? Or do you think this is specific to your situation? Pushing yourself too far and becoming obsessed with your goals and dreams is the side effect of being an overachiever. The same obsession which allows you to attain a high level of achievement also results in injuries and being psychologically burnt out. Being mentally focused all the time, takes its toll. I am the same with all sports. Before climbing, I was a competitive swimmer. Now, I have no desire to swim unless I’m snorkelling with fish in the tropics. 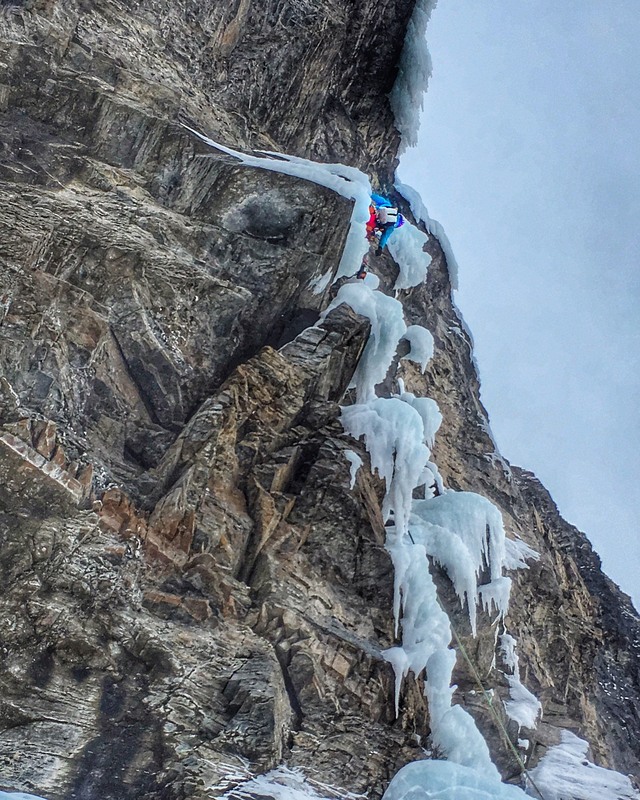 After you’ve recovered from your injury, where do you see yourself and your ice-climbing career going in the future? I hope that when that I come back from this injury, I will come back both physically and mentally stronger. I have experience now which is far more useful than youthful ignorance. In many ways, I’m much stronger than when I was 20. I have learnt a lot about myself and I’ve had to accept that I’m no longer twenty years old. Despite my brain telling me I am twenty, the reality is my body has begun to slow down. I have had to learn how to care for myself as I age. I know many people much older than myself who continue to perform at an elite-level but they don’t train how they used to. I have many years of ice climbing ahead of me. I just need to be smarter with my training. Before long, I will be back ice climbing again, only this time I will have the lessons my injury has taught me. To find out more about Beth’s story click here. Photographs by David Clifford, David Roetzel and Janette Heung.